On April 19, 2017, from 11:45 a.m. to 1:00 p.m., Attorney Matt Lager will be giving a seminar on Workers’ Compensation (for non-attorneys!) at Advanced Rehabilitation at 3347 W 12th St., Erie, PA, 16505. Advanced Rehabilitation is a premier Erie, PA Physical Therapy facility that provides state-of-the-art rehabilitation techniques and prides itself on helping injured workers recover from injuries so they can safely get back to work and return to their normal lives! Advanced Rehabilitation also provides useful services, such as Functional Capacity Evaluations, which help injured workers return to work in such a capacity that they will not re-injure themselves. 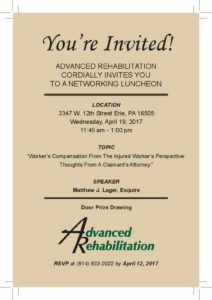 These informational seminars are free to attend, include lunch, and also serve as valuable networking luncheons to those who regularly interact with the workers’ compensation system. Past speakers have included orthopedic surgeons and nurses on a variety of topics, from back surgeries to Medicare Set Asides (MSAs). What will be covered in this seminar? After the seminar, there will be an open Q & A where you will be free to ask general workers’ compensation questions (but nothing case specific!). This will be an open-ended discussion where those in attendance can get a claimant’s attorney’s perspective on the workers’ compensation system. What if I have questions but can’t attend the seminar? If you have any questions regarding any of the above topics, or are in injured worker looking for legal representation, call our office today for a free consultation at 814-452-6232! No Recovery, No Fee Lawyers in Erie, PA: What does “Contingent Fee” Mean?